I've no idea why Pho Bac in Irvine changed its name to Pho Ba Co. But you know what? I don't care. There might have been an ownership change or perhaps not. 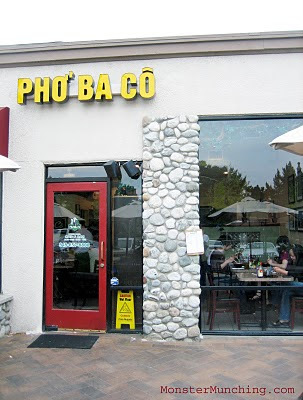 There are still other Pho Bac's around, namely Pho Bac Ky in Tustin and another in Irvine, on University. But this one, which is the original that bred the others, has done steady business for years. It is arguably the most consistently popular pho joint in Irvine. The fact that I had to wait for a seat proves that it will continue to be. Apart from the new logo, which depicts who I presume are the three female owners immortalized in cartoon form in a Charlie's Angels pose, the menu looks unchanged. There are still the endless permutations of pho (brisket, rare beef, tendon, etc.) --enough to keep busy the Irvinite who's too lazy to schlep it to Little Saigon. 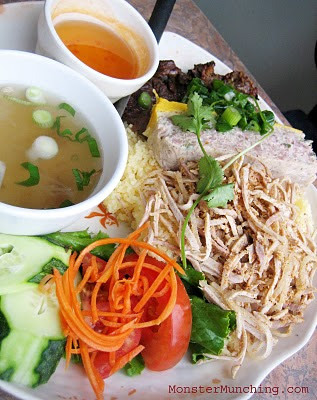 As usual, I wasn't there for the pho. It was the special combo for me, which employed crinkly egg noodle instead of the white rice and a clear pork/chicken broth instead of their beef. 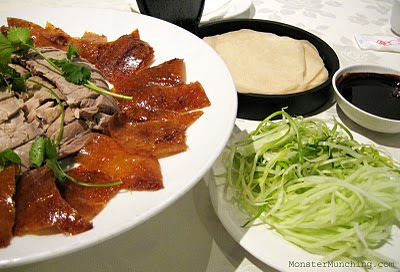 Included in the soup, as it always has, is a fried wonton skin disc and a leaf of butter lettuce. The former is half submerged in the soup, which I save for last as long as I can, squirting Sriracha on it when I can't wait any longer. The best part of the dish is actually the meatballs. Textured with bits of chewy tendon in it, they taste like they were homemade. Those haven't changed. What has changed is the way you can take your bowls. There used to be one size offered: large. If you're thinking of doing the dish, opt for it. 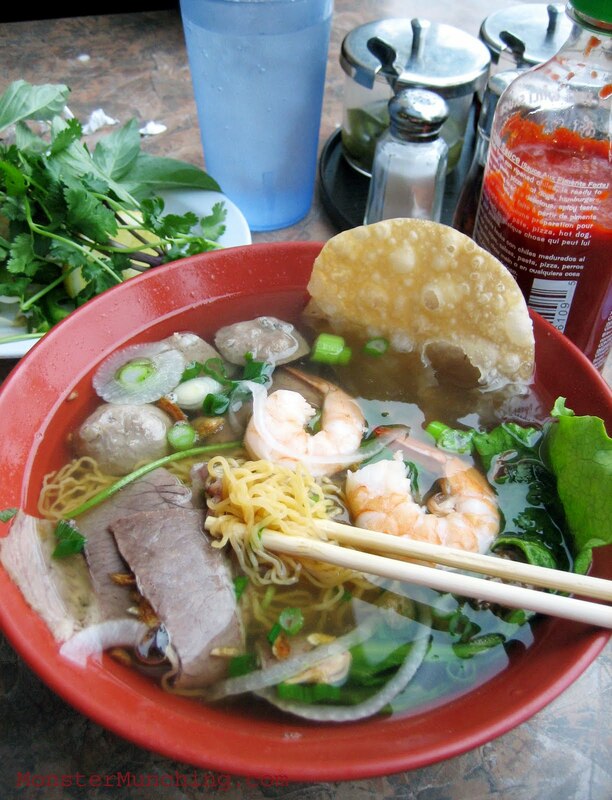 The small is almost like an appetizer bowl of noodle soup and will not satiate. You will most certainly end up bumming off more food from whoever you are dining with. After I finished the last drop, my chopsticks wandered over to my tablemate's rice plate, whereupon I noticed a few other things have changed. They're now serving yellow rice instead of just the plain. Also, the pho broth included for sipping isn't as lip-smackingly salty as it used to be. By the end of it all, we were too full to order the Black Sea drink, a pandan and black jelly dessert slushie-thingy that we always make a point to order at the start of the meal but never get to when we finish. The more things change, the more they stay the same. If there's one Japanese dish that has transcended and criss-crossed all cultural lines in America more than any other, it's teriyaki. You could get a teriyaki bowl to chase your Sourdough Jack at Jack-in-the-Box. 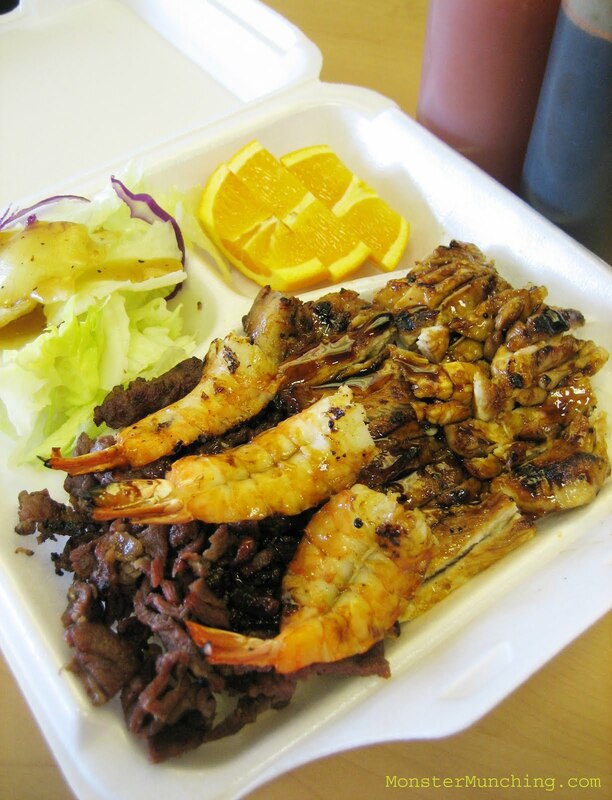 Santa Ana and Westminster has more than a few Mexican and Vietnamese joints serving teriyaki along with tacos and banh mi. And let's not forget the ubiquity of Orange County's home-grown teriyaki titan, Flame Broiler, which, by the way, was started by a Korean. 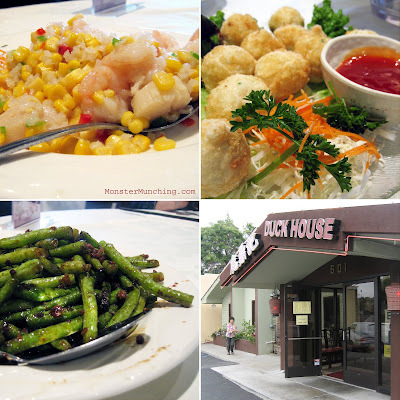 Yogi's in Tustin is also run by a Korean family. The kid does his homework at a table near the back. Mom minds the register. Dad helps. But the dudes who do the actual cooking are their Latino employees. One gent tends to smoky grill and transforms thin planks of boneless, skinless chicken into blissfully wonderful things. Flipped over as they sizzle on the hot grates, the edges burn to a sweet, crispy char. 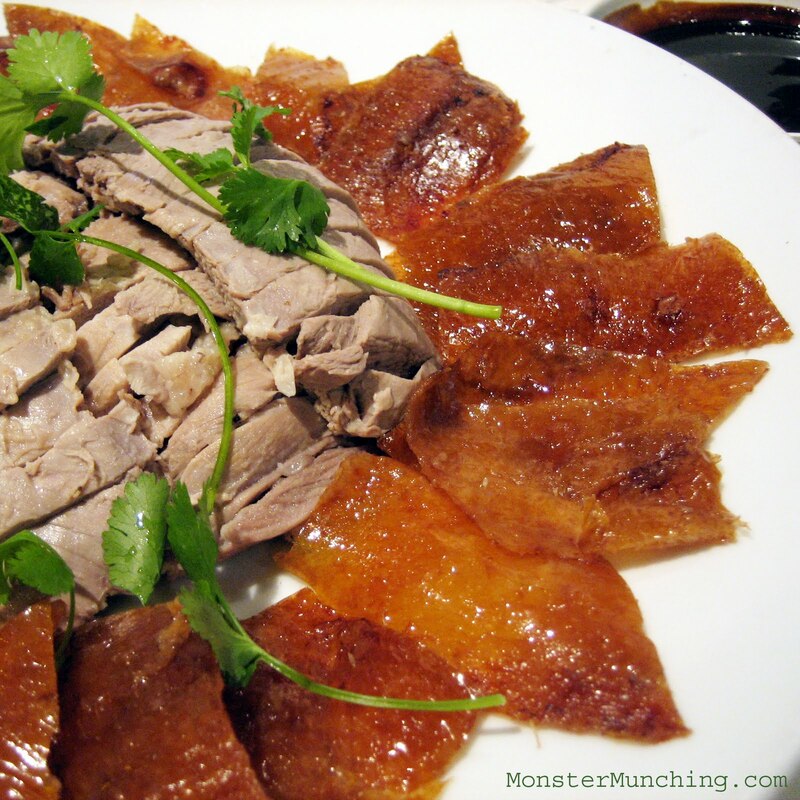 The meat in the middle remains tenderly moist and becomes infused with smokiness. They're served chopped into spears and laid down over the rice as if to say "Ta-daa!" You don't even need to squirt their homemade teriyaki glaze supplied in squeeze bottles, but you might as well. The sauce is excellent, with just a hint of mirin's alcoholic tang still haunting the brew. What you see in my picture is the combo plate, which retails for $7.99 and includes too-chewy BBQ beef chopped into nubbins and anorexic shrimp. Do not get this. Shun the surf and turf for the poultry. The chicken is what you want and all you need. When you eat it, you will be thankful there's nothing else that interrupts the Zen-perfection of its execution. It'll have you saying "Yoshinoya who?" *Special Thanks to my friend Alosha (a.k.a. Melissa) for the tip. It's a veritable sausagefest out there. As I type this, a new gourmet wiener joint called Berkeley Dog has just been erected in Mission Viejo. It will soon be a double team when another store comes to Brea in August. In Long Beach, The Dog House has been shoving their Cajun Hot Links, bratwursts and foot long franks into crusty buns for the better part of a year, going by the same game plan as Berkeley Dog, which, it must be noted, is inspired by Top Dog, a hot dog house in, you guessed it, Berkeley. And it was earlier this year that two Indonesian sisters opened Valhalla Table, an ode to beer and artisan brats (the kind you eat, not the kind you spank...wait...oh never mind). Why the sudden spike in sausage love? Frankly (pun intended), I don't know. Even if there was no causal link (thank you, I'm here all week), all of it makes me nostalgic for when a hot dog is just a Kosher style frankfurter, where the buns are spongy and the relish as green as Nickelodeon slime. I'm talking, of course, about a Chicago-style dog, the kind touted ad nauseam by re-runs of too-similar-sounding Travel Channel series and other food shows that function, more or less, like commercials for places like Superdawg and Portillo's. There's a Portillo's in Buena Park, as everyone knows, which I have not tried. But there's also Mustard's in Los Alamitos, which must be the anti-Portillo's since it looks like a working-class watering hole more than a theme-park-adjacent tourist attraction. Mustard's has on its walls more than a few nods to Chicago. The Bulls, the Bears, the Cubs and the White Sox are all represented canonically with framed pictures, articles, pennants and other memorabilia. On the menu, you'll find sandwiches named after Mayor Daley, Comiskey Park and at least one char-burnished dog called "The Great Chicago Fire" -- a title that would've been distasteful if the tragedy didn't happen back in 1871. 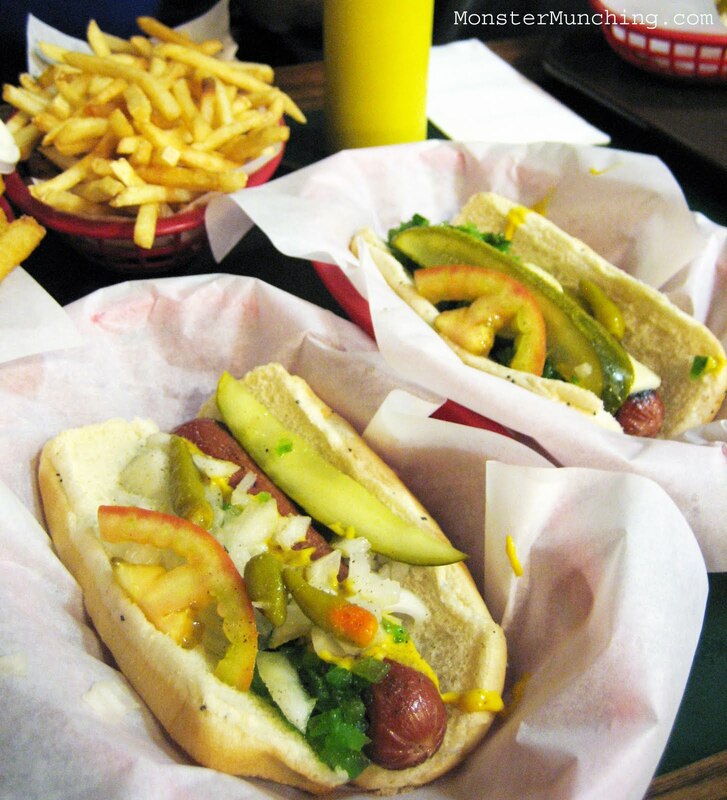 You'll find that the fries taste no better than a fast-food drive thru's, but the dogs here will satisfy your Windy City loving heart. It's the requisite acidity of pickled sport peppers, the weird candy sweetness of the relish, and salty-juice spurting tube of meat that manages to assert itself over it all -- just the mouthful you need to bring you closer to the City of Oprah.